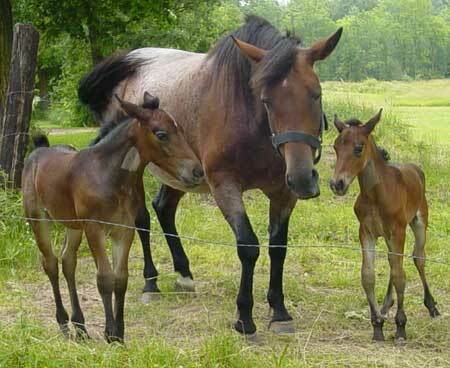 Yvonne Cottrell¹s husband Jack raised Percherons and always dreamed of having a blue roan foal. In the spring of 2004 he borrowed a red roan Percheron/Quarterhorse mare from their neighbor Gary Steiner of Finlayson, Minnesota, and bred it to his registered black Percheron. 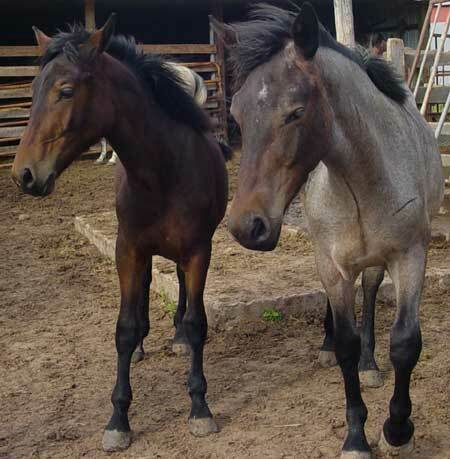 On June 4th of 2005 she had a pair of twin fillies, one of which is a blue roan. Jack never got to see the twins. He died of cancer in November, but the family derives great comfort to go to the barn and visit those foals, Faith and Hope. The picture below shows the twins at one year.